Ediacara organisms are among the oldest known life forms, having lived more than 540 million years ago. But until now, scientific knowledge about the creatures has come from fossils in the form of molds and casts with only their external features preserved. A new fossil locality in southern China, however, is giving paleontologists a more detailed look at the early body plans of these strange creatures. Ediacara fossils  representing small, soft-bodied creatures without mineralized skeletons  are usually captured in sandstones. Most Ediacara organisms are thought to have disappeared altogether during the beginning of the Cambrian Explosion, 544 million years ago, when a whole host of new life forms began to emerge with hard, mineralized skeletons, such as trilobites and mollusks. Because the Ediacara fossils are usually molds and casts, it is difficult to describe them, interpret their lifestyles or put them in an evolutionary context. In the 1980s, Yale University paleontologist Adolf Seilacher proposed that some Ediacaran organisms shared a particular body plan and grouped them together, calling them vendobionts. No one knows exactly what these creatures are, but the new fossils found in the Dengying Formation of southern China by a team of scientists from Virginia Tech and the Nanjing Institute of Geology and Paleontology in China reveal some new details of the curious branching structures. A team of paleontologists recently discovered well-preserved Ediacara fossils in limestone in the Precambrian Dengying Formation, located atop of this mountain in southern China. 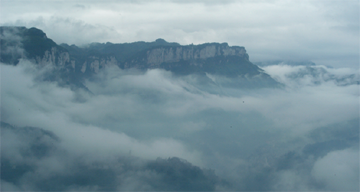 Below the Dengying, obscured by the clouds in the photograph, lies the older Doushantuo Formation, dated between 635 and 551 million years old. Images courtesy of Bing Shen. Radiometrically dated between 551 and 538 million years old, the newly discovered vendobionts, preserved in a limestone matrix, have internal structures replaced by calcite spars, says Bing Shen, a graduate student at Virginia Tech and co-author of the paper, published in the July 11 Online Early Edition of the Proceedings of the National Academy of Sciences. The creatures have a unique body plan never before seen in living or extinct creatures, Shen says. Previously, Seilacher, who first described the organisms in detail from molds and casts, hypothesized that vendobionts were made up of enclosed tube-like structures, connected together and filled with cytoplasm, much like an air mattress meant for the swimming pool, says David Bottjer, a paleoecologist at the University of Southern California at Santa Cruz, who was not involved with the research. 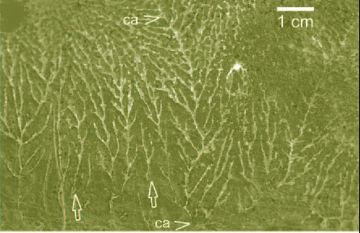 Analyzing thin-sections of the fossils, Shen and the team verified that the organisms did have a tube-like structure internally, but each tube was not enclosed. Rather, one end was open to the environment, which means "they could not be filled with cytoplasm, as predicted by Seilacher," Shen says. The fossil find is "verification that there are biota that may not exist any more," Bottjer says, and it tells us that before the Cambrian Explosion, "there were a lot of strange things out there." No definitive evidence points to whether these strange creatures are plant or animal. "We don't know," he says, "but maybe it's not related to anything." To learn more, "we need to go out and look for other places" where these types of carbonate formations may hold 3-D specimens of other early organisms, Bottjer says. These branching structures are fossil "vendobionts," some of the oldest organisms found on Earth. The exceptional 3-D preservation of their soft bodies may shed light on early life. Shen and his colleagues plan to perform other analyses of the specimens, including some geochemical work. They will also return to the field in search of more Ediacara fossils in the previously overlooked carbonate rocks. "It is important to search more limestone for different fossil anatomies [and] ecologies," Shen says. What exactly the vendobionts were and how they lived is still a point of speculation. Indeed, the team has several ideas about why the organisms went extinct during the Cambrian, including a change in the environment. Another possibility, they say, is that because the vendobionts were sedentary creatures  lying about on the seafloor  organisms that could burrow into and crawl across the ocean bottom may have disrupted the lifestyle of the vendobionts.